Home page Technology What Makes SMARTePLANS Unique? The one on the left looks like the same old builder / architect plan of a structure you’ve seen everywhere. 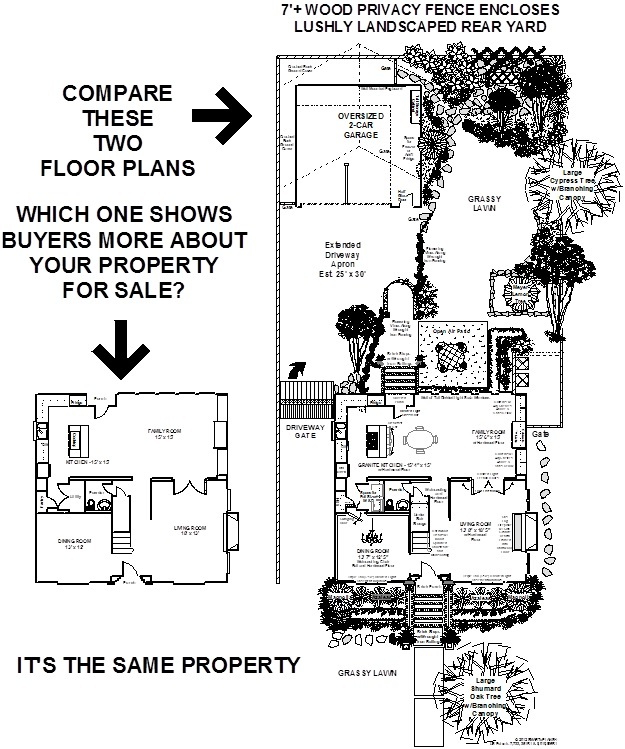 The SMARTePLAN on the right shows the home as it sits on the property. Which one do you think gives more information to a prospective buyer about your property for sale? And this is BEFORE the drawing is integrated with the professional photography that launches out of it. This is just the-flying-at-30,000 ft-view, before you MAGNIFY the plans online allowing buyers to see even the teeniest detail and annotation. If this is your home for sale …which one do YOU want representing your property to buyers on MLS? 2 Patents on the technology — we wouldn’t have 2 patents on our technology if our product was the same as floor plan drawings elsewhere. Simply put …. Nobody CAN show your property like we do! A single self-contained pictorial property file with embedded photography inter-linked with detailed text descriptions that can be uploaded onto MLS, emailed and posted on websites and social media. Does Not Have to Be on MLS! Effective and efficient marketing facilitates private and confidential sales …. which are often desirable by celebrities and high profile clients.